PACTS tweeted that their submission: ”Includes suggestions for better analysis of road casualty stats which would show harm as well as vulnerability and encourage danger reduction and active travel policies.” The purpose of this post is to build on their analysis to do just that. Here I refer to a key section of their document (I have abridged it – I strongly suggest you read the original). • It does not distinguish benign modes from dangerous ones, i.e. those modes sustaining the casualties and those inflicting them. • It assesses at length, with graphs, rates and commentary, the “vulnerability” of different road users, mainly of active travel modes. • It does not clearly convey that, for the vast majority of UK road users, they are much more likely to be killed in a car, or by car, than any other mode. 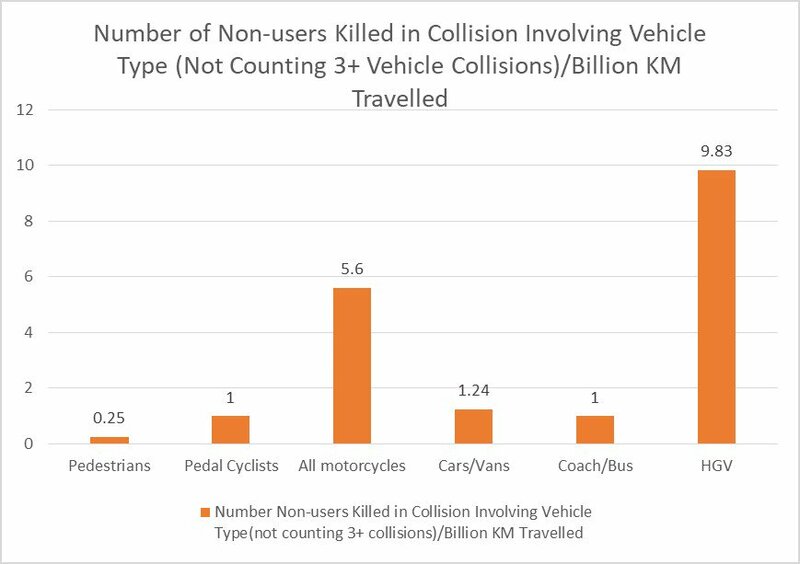 • It compares user fatality rates per distance travelled, concluding that walking and cycling are “high risk” modes whilst cars, buses and HGVs are low risk. This implies the trips are similar and interchangeable, which generally they are not. The average person travels over 5,000 miles by car/van per year. By comparison, the average person walks and cycles fewer than 300 miles per year. Even under the most optimistic CWIS (The Government’s Cycling and Walking Investment Strategy) scenario, there is no prospect that these trips or miles would be substituted on a like for like basis. • Casualty numbers and risks are often measured in terms of those Killed and Seriously Injured (KSI). However, as there are approximately 13 reported serious injuries for every one fatality, KSI is really a measure of serious injuries. In addition, the UK definition of Serious Injury used in STATS19 is very broad. It ranges from cuts and minor fractures to dying more than 30 days after the collision. Whilst this may be a reasonable definition for road safety purposes, it makes KSIs a very crude assessment of risk. This has a bearing on assessing the risks of active travel. Cyclists have a much higher ratio of reported serious injuries to fatalities (36:1 in 2017) than car occupants (11:1) and the percentage of clinically serious (MAIS3+) injuries for cyclists admitted to hospital was lower (9%) than for any other road user group. In other words, cyclists may be involved in more KSIs but they are predominantly minor “serious injuries”. Teasing this out a little, take a look at the illustration below from SWOV in the Netherlands (with a population 3.9 times smaller), also for deaths in 2017. Of course, this does not imply legal responsibility is always that of the user of the third party. Nevertheless, I think this is a good indicator of “Who Kills Whom”. Figure Three gets closer to an understanding of which modes (or modes’ use) are implicated in the deaths of other road users. This in turn will lead us to assessing which modes pose more or less threat to others on the road (the two are different, albeit related, characteristics). This means that 65% of traffic (i.e. motor traffic) is on roads used relatively less by pedestrians and cyclists. So, to make a better comparison of involvement in pedestrian deaths I have shown in the next figure pedestrian deaths by involvement with other road users (per billion vehicle kilometres) in urban areas only, again for 2017. Firstly, I have used deaths for uniformity and as these are the most reliable statistics, with fewer problems from non-reporting. However, this does mean that analysis is limited by some very small numbers, such as the three pedestrians killed in 2017 in collisions with pedal cycles. A different picture can emerge if using the less reliable Serious Injuries figures as well. Secondly, there are two “stand-out” vehicle classes for involvement in pedestrian deaths – and these are similar to those for all other 3rd parties as shown in Figure Three, namely HGVs and, to a lesser extent, motorcycles. Fourthly, buses and coaches seem to be very low for involvement in both Figures Three and Four. Fifthly, while bicycles are at a very low level of involvement, they are not as low as pedestrians in Figure Three. I now want to make a further step in the analysis of these figures which looks at what lies behind these levels of involvement. This is where we look at potential lethality of different modes. So: why is it that we see these differences in involvement? 1. HGVs. For some time we have known that HVs are heavily represented (compared to their modal share) in urban cyclist deaths – approximately 50% of cyclist deaths in London for the last couple of decades, despite lorries being some 5% of traffic. The figures for pedestrians are similar. Attention has been on the “blind spots” for HGV drivers that make it difficult for them to see pedestrians or cyclists near their vehicle, and the gap between vehicle body and tarmac, which is large enough for pedestrians and cyclists to be run over by what are very heavy vehicles. So far, so straightforward. 2. Buses and coaches. There are design features on modern buses which reduce danger to pedestrians: unlike HGVs there is Direct Vision on many, and generally a smaller gap between bus body and tarmac. Bus drivers are professionally trained: but so are HGV drivers, and bus drivers are under pressure to reduce “headway” and have other pressures on them. So the position of buses and coaches in both figures three and four is very low, and indeed lower than we might expect. 3. Motorcycles. The involvement rate is high here. We know that motorcycle users have a far higher user KSI rate than other modes by some way. But why the especially high figure for involvement with other users generally and pedestrians, as shown in figures three and four? 4. Cars. 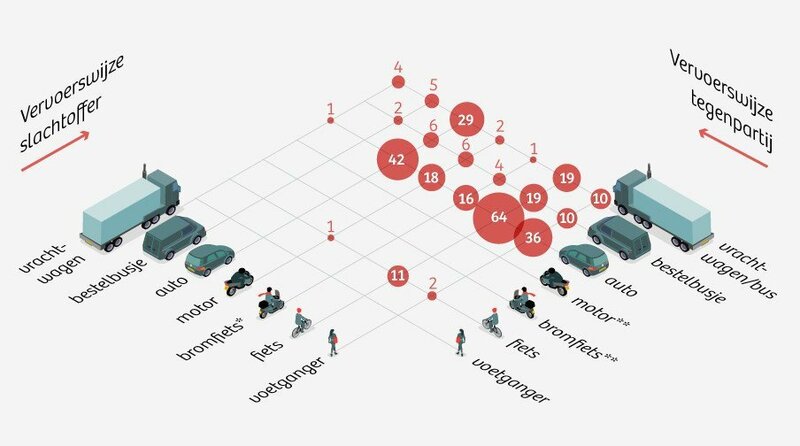 Again, although the figure for cars is higher than buses/coaches and bicycles, it is still a lot lower than motorcycles. Cars have a wider frontal area than motorcycles and can be used at similar speeds – so why is their involvement so much lower than motorcycles? This is the key element of what we mean by “road danger”. It is essentially a product of the MASS of the vehicle (what most people understand as “weight”) and the SPEED it is travelling at when it hits a pedestrian. (When it hits another vehicle, the speed and mass of both vehicles have to be considered). It’s why we in the Road Danger Reduction movement spend so much time seeing motor vehicle usage as the problem: it isn’t because of the personalities or intentions of drivers, it’s because of the physics involved. (This point is made nicely by the journalist Peter Walker ). It’s why anybody concerned with pedestrian safety has been urging communities to accept that motor vehicles should go no more than 20 mph if there are pedestrians in the vicinity. Partly this is because of the biomechanics of injury sustained by pedestrians – 20 mph is at the upper limit – but also because as speed goes up the energy potentially released increases exponentially: the usual figures quoted for pedestrian death rates in collisions with motor vehicles are 10% (or lower) at 20 mph; 50% at 30 mph and right up to 90% at 40 mph. This is all shown above by comparing motorcycle and bicycle involvement rates: essentially motorcycles can be used at much higher speeds than bicycles (particularly well above 20 mph) and also have much greater mass. But it doesn’t explain why cars, vans and buses are as low as they are. Buses tend not to go that much over 20 mph on routes in London, but cars and vans can and do. What is the reason for these levels of involvement being lower than we might expect just from looking at potential kinetic energy released on impact? A crucial element of the Road Danger Reduction approach is to accept that human beings constantly adapt their behaviour to their perceptions of danger. After some time being exposed to motor traffic – and the instructions from anxious parents and others – pedestrians tend to develop an awareness of what may pose a threat to their safety. This will affect how they actually behave in the highway environment. 1. Despite some awareness of the danger posed by HGVs, there is a problem with non-Direct Vision HGV cabs, and the consequences of making even small mistakes are very extreme. The figures for Serious Injuries (SIs) are less than twice as high as those for Killed – whereas the average for all vehicles is over ten times as high. 2. Buses are very large and generally coloured red in London, taking up predictable positions in traffic, frequently in specific bus lanes. This would suggest a high level of pedestrian awareness of the threat, and accordingly a higher level of care taken. 3. By contrast with 1 and 2. above, motorcycles have a much narrower profile and are less easy for pedestrians to predict. I would argue this is a key factor in the high level of motorcycle involvement in pedestrian deaths. 4. Cars are a lot easier to see than motorcycles, and along with vans always make up a significant part of the traffic on roads in urban areas. People expect them. Therefore their involvement rate is lower than motorcycles, and not much higher than bicycles. I have attempted to present collision involvement rates, but also look at what lies behind them. This should indicate where practitioners should focus their attention when it comes to reducing danger. As ever, the indications are that attention should be paid to motor vehicles of all types – with particular issues around each of the motorised modes – before cyclists. Finally, we note that this type of discussion is unusual among transport professionals, and hope that it sparks comment and debate.